Echo envisions a world of nonviolence in which adults respect children by ensuring their right to emotional and physical safety. 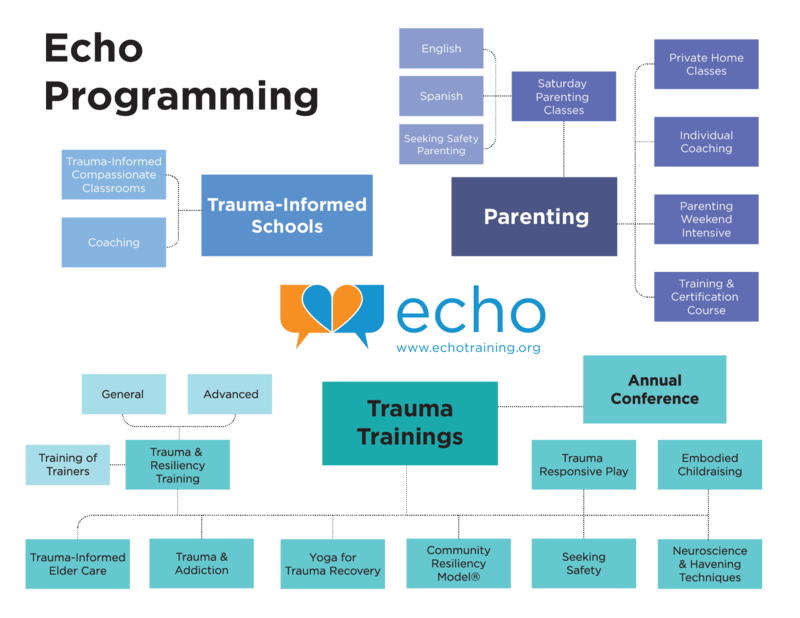 The mission of Echo is to educate parents and service professionals about trauma and resilience in order to prevent retraumatization, resolve individual and community-level trauma, and create the safe, stable, nurturing relationships that break the cycle of generational trauma and allow us to heal. Our approach draws on attachment theory, the latest science on trauma and resilience, survivor wisdom, and the principles of nonviolent communication and trauma-informed care. We believe that all behavior is communication, whether of past hurts or current needs, and that the best way to meet someone in all their humanity is not to manipulate behavior through punishments and rewards but to help them find strategies for regulation and meeting their needs in a way that is safe for them and others. We help parents and other adult trauma survivors acquire the tools to create the compassionate connections that they may have lacked as a child and thus enable them to offer future generations safety, empathy and understanding.